1 Year Limited Warranty. Need help? Please contact VIGO customer support at 1-866-591-7792. Plumbing Repairs made easy: Replacement lavatory sink Pop-up Plug fits MOEN 5 inch Drains . JAG Plumbing Products strives to bring customers the best products in Canada and make them available on the best online shopping platform: Homedepot.ca - Owned and Operated in Ajax, Ontario, Canada, JAG PLUMBING prides itself on offering Home Depot Customers durable, high quality, non OEM replacement plumbing parts. The Clearflo adjustable trip lever pop-up drain works perfectly with 17- to 24-inch deep baths. Your bath will be even more relaxing because you can depend on solid-brass construction for durability and reliability. KOHLER finishes resist corrosion and tarnishing, exceeding industry durability standards over two times. And you have installation flexibility with above- or through-the-floor options. This 100% lead-free brass pop-up drain is designed to fit any sink with overflow measuring 1.5" - 1.75". For easy installation, all required rubber gaskets are included. Match the finish to your bathroom faucet for a beautifully coordinated look. 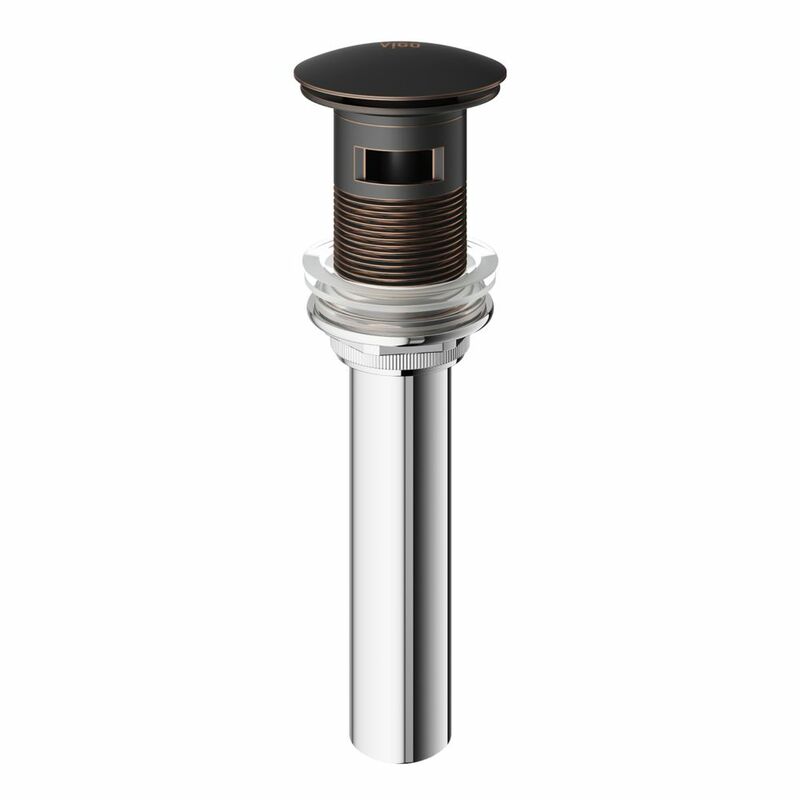 Benefits & Features: Lead-Free Brass Construction Superior Corrosion & Rust-Resistant Finish Designed to Work w/ Sinks w/ Overflow Fits Standard 1.75" Drain Opening All Rubber Gaskets Included for Installation Limited Lifetime Warranty height: 7.56" diameter: 2.5" drain hole size: 1.5" b 1.75" connection size: 1.25"
Pop-up Drain with Overflow in Antique Rubbed Bronze is rated 4.5 out of 5 by 35. Rated 2 out of 5 by CaptMatt from Oddly Home Depot carries the antique bronze Vigo faucet and... Oddly Home Depot carries the antique bronze Vigo faucet and different colored oil rubbed bronze Vigo overflow drain. Had to special order. Looks great, but when you close drain it doesn’t hold the water in the bowl very well. You can hear a constant trickle going down the drain. Rated 5 out of 5 by ValentineLady from Looks beautiful and works great! Looks beautiful and works great! Rated 5 out of 5 by GaryA from Excellent quality drain I ordered a few to replace the existing drains while matching our taps. I saw them on-line and would have liked to see them in the store but not available. Ordered them and was amazed at the quality of the finish, and the care taken to package and ship the product. Clearly, they care about their product and having it arrive in excellent condition. Thus they must care about the quality of the construction of the drain. Well worth the couple dollars more. Much better than available in-store. Rated 5 out of 5 by New Bathroom Queen from Solid Construction This drain is very sturdy construction. It works well and looks great. We had a plumber install it so not sure how difficult to install. Rated 3 out of 5 by Nightraven from Fancy box decent quality annoying logo Comes in a nice fancy padded box to protect the finish during shipping. Was a bit of a challenge to get it to seal at first. We weren’t aware that the drain cap had a logo on the top of it. So we were not thrilled when we opened the box and saw it. The photo on the website doesn’t show it. Rated 5 out of 5 by JudyB from Stylish Have this pop-up drain in two bathrooms for the past 2 months. Very stylish and works perfectly. Rated 5 out of 5 by DiyJack from We used this item to finish off the remodel project of our bathroom vanity. Thus equipped, it has... We used this item to finish off the remodel project of our bathroom vanity. Thus equipped, it has gained quite a number of favorable comments from our visitors! The assembly was a straightforward plumbing job. No issues there. The rubbed bronze finish is quite attractive. This matches the innovative tap and the rubbed bronze ring on which the bowl rests (not visible in picture). Pressing the drain pops it down and locks it in position when you want to keep the water in the bowl. Pressing it again will release it, so the water drains. it works as advertized, so we are happy with our purchase. it perfectly complements our remodeled bathroom! We easily ordered this item online and picked up at the friendly customer service of our local Home Depot. Rated 4 out of 5 by G man from Easy Great drain to accompany the vigo vessel faucet i bought. Easy to install. Easy to clean out drain.